We’ve been in our new house for about a month and it’s been a whirlwind of unpacking boxes and trying to figure out what to do in each room. I’ve been itching to tackle a project that I could do with my broken foot, and our small hallway seemed like a good place to start. I thought we had a small hallway in our Illinois house but this one beats it by a mile. It’s small and dark, which is a tough combo to work with. 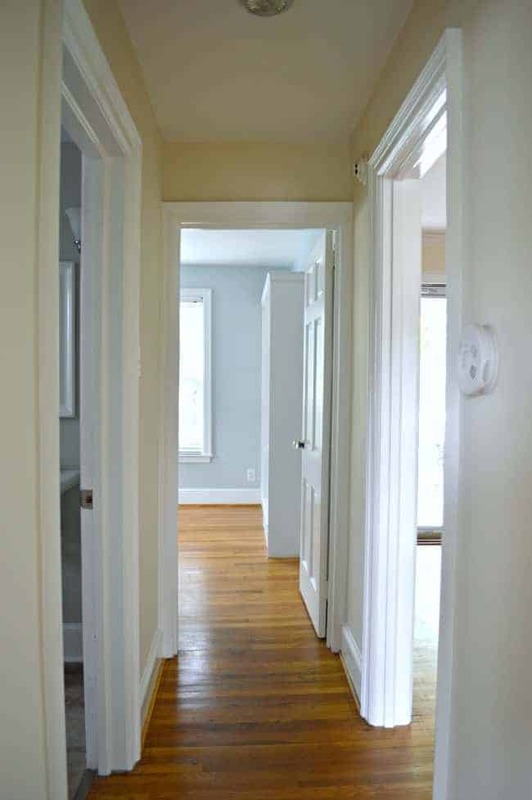 Here is the hallway from our last house, after it was painted for the second time. The hallway in the new house connects our living room to the bathroom, master bedroom and guest bedroom. It may be a tiny, dark space, but it’s an important piece of real estate, and one that shouldn’t be ignored. So knowing that I had a challenge, I did what I always do when I have a tough space to decorate…search the internet. 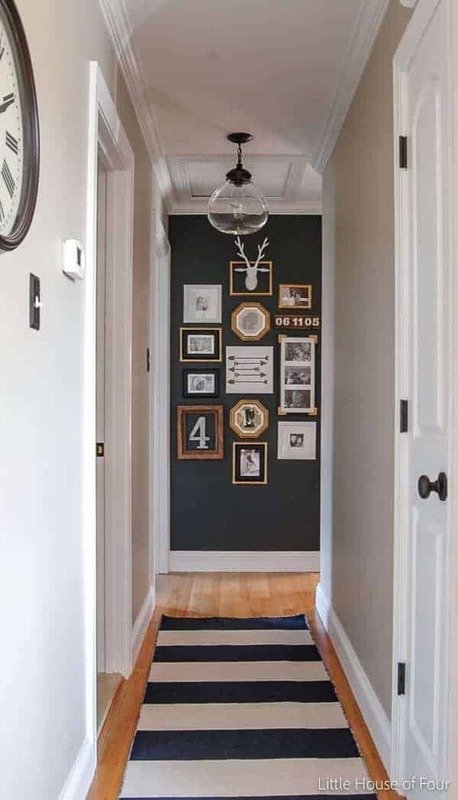 There’s tons of inspiring hallway decorating ideas out there and I thought I’d share some of my favorites. 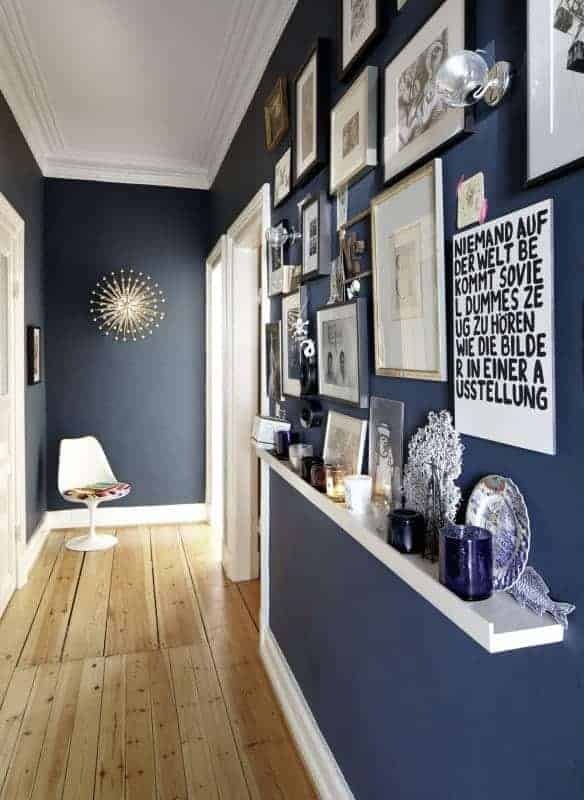 Gallery walls are always a great idea, even in a small space, and look at that dark wall. 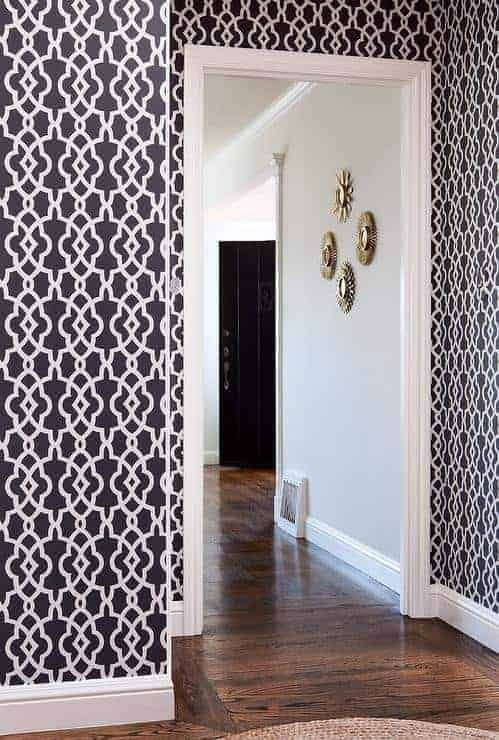 What about a fun, bold wallpaper for a small hallway? 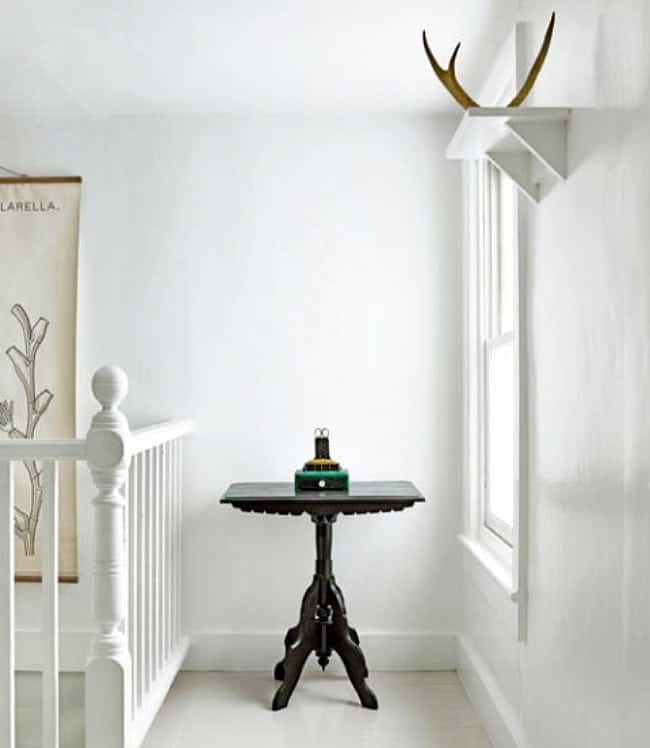 If wallpaper isn’t your thing, why not go dramatic with paint. A small hallway would be a great place to showcase a collection. Or you could go with a simple style. There’s no rule that says you have to have pictures on your walls. I just have a few small tweaks to make and our hallway will be ready for it’s debut. Can’t wait to share it. If you haven’t seen it yet, here’s a video tour of our new house. I agree simple is the way to go but I would be tempted to use a soft color on the walls. For me, I would have to use a soft teal because I can’t live without teal somewhere/everywhere! ? Ah…teal. I agree…you gotta have teal somewhere. 😉 I had it in a guest bedroom in my Illinois house and I hope to use it again in a room in my new house. My favorite is your old hallway! I love that pop of blue! I really miss the blue. I may have to use it somewhere in the new house. I think the dark hallways look very dramatic, but I think they would be difficult to live with. I like the simple look the best. However, I’m sure whatever you do will look great. 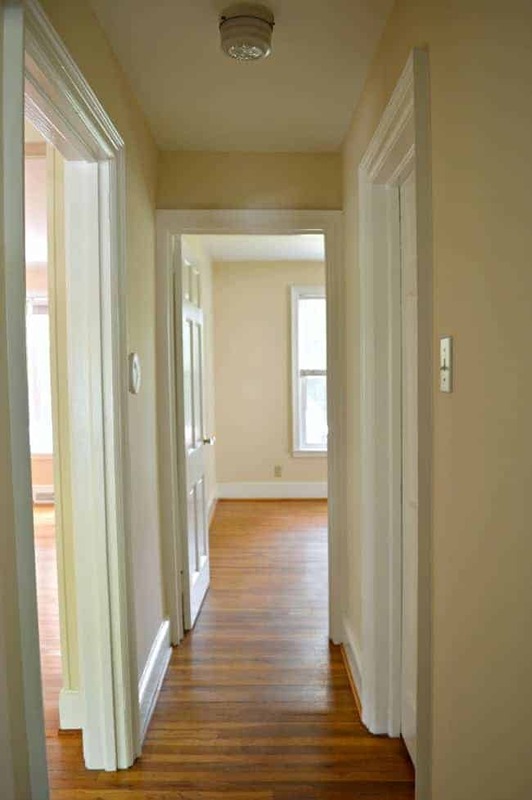 The hallway from your former home proves you know what you’re doing! I agree with you about the dark hallways. Very dramatic and lovely, but hard to live with. Thanks so much for your sweet comment, Michelle. I really appreciate your kind words. Love the hallway with the large clock, pendant lighting, & the decor on the end of wall. Blue & white, but no wall paper. You have a lovely simple home, so I would stay with that theme. Hope your foot is doing well!! Love that hallway too, Karen. I think it was the right treatment for that space. I like the blue hallway but not all the pictures on the wall. I am more into simplicity. 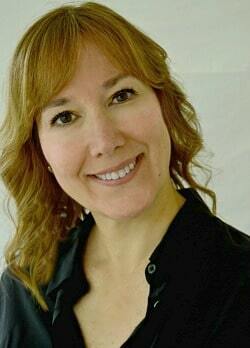 I know you like simplicity, Debbie. Most of the time it’s the right thing for my spaces too. Buying paint today for my “timy hall”. Thanks for thr tip and a fun site.?? I definitely like it simple especially if you have such a piece of furniture to catch the eye as in the last picture. Simple is a great way to go and that’s usually what I prefer. Love that last photo.